My daughter suspiciously eyed her zucchini as if it might jump into her mouth without her consent. Her sister sighed, dropping her fork on the table. “Not for me, thanks,” she muttered. My oldest son just sat mutely, miserably confronting the meat touching the vegetables touching the noodles. Only the youngest cheerfully scooped up bite after bite of the recipe I had been sure they’d all enjoy. My frustration mounted as my appetite retreated before their mournful, disgusted, displeased faces. Didn’t they care that I had worked hard to make a dinner that would please everyone? How could they be so ungrateful? We sat at a silent impasse as my husband and youngest son tried their hardest to have a pleasant meal. I remembered my grandmother’s voice as I was growing up: lectures to chew each bite twenty times to aid digestion, chiding to be sure to be members of the Clean Plate Club, reminders that some children in China had nothing to eat. I was the stubborn kid during those meals, hiding brussels sprouts in mashed potatoes, stashing chewy meat bits in my napkin under the plate, sometimes sitting all alone because I refused to finish what was before me. Even more recently, I begged God daily for the chance to become a mother as we struggled with infertility. Yet here I sat, staring down the answers to so many prayers, resenting them for not loving the dinner we’re sharing around a table in our home as we do every evening. How quickly I forget that God knows my needs and is caring for me. In today’s readings, the Israelites have already forgotten the suffering and pain of Egypt as they turn on Moses. “Would that we had died in Egypt!” they say. (Exodus 16:3) If God was the kind of parent that I am sometimes, He might have said to them, “Fine, have it your way,” and left them to their own devices. But He didn’t. He gave them what they need; more than that, He gave in abundance. They were fed, because He loves them and cares for them, even when they complain. Do we ever complain about our situation without remembering how far God has already brought us? He knows our needs, every single one, even before we ask Him. Instead of complaining, let’s try thanking Him for all He has done for us and trusting that He will meet our needs, too. 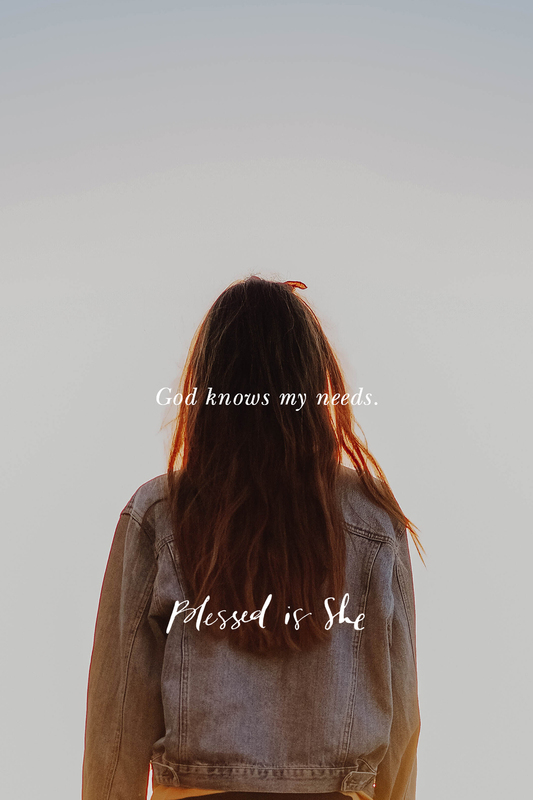 Abbey Dupuy is the Assistant Theological Editor for Blessed is She and writes her life as a homeschooling mama of four frequently barefoot children. She muses about imperfect parenting, practicing gratitude, and celebrating the liturgical year with her young family on her blog. In her spare time, she enjoys running, gardening, coffee, and cookbooks, not usually at at the same time. You can find out more about her here. She is the author of our Blessed Conversations: The Virtues study found here.